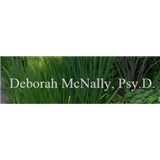 Deborah McNally (Chicago) - Book Appointment Online! I am a licensed clinical psychologist with over 25 years of experience working with people to help them overcome issues that are holding them back from reaching their full potential or from feeling their best and being the person they were meant to be. I work with adults, both individuals and couples. I believe that psychotherapy is a collaborative process in which which we will make a connection and then work together to find a solution to the problem. Some of the problems I work with are depression, anxiety, grief/loss, parenting, emotional stress, relationship issues. Additionally I work with many patients who have chronic illnesses including cancer and the psychological issues that result. I will tailor my treatment to your needs and will provide a safe, supportive and non-judgmental environment. Dr. McNally is very knowledgeable and intelligent. She knows how to listen and will never make you feel that your issues/problems are irrelevant. I was blushing everyday and this problem seem to come out of nowhere. I began to fear I would blush, which was making me blush even more. I saw Dr. McNally on a weekly basis for about 10 weeks and I rarely blush anymore. She helped me get some confidence back and I'm so thankful for her help. She's awesome!! Thank you Dr. McNally.